To find the blacktip shark, just explore the shallow waters or offshore of Miami Beach. The fish can be recognized by its long gill slits, pointed snout, no ridges between its dorsal fins, and a black tip on the fin that is responsible for the fish’s name. Some blacktip sharks are able to reach lengths as long as seven feet or more. 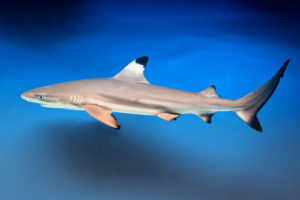 Blacktip sharks have developed a reputation for their energy, swiftness, and ability to leap out of the water in a spinning mission to prey on schools of fish. Even with these fearsome qualities, the blacktip shark is believed to be “timid” fish in its behavior. Even with its imposing appearance, blacktip sharks will typically try and avoid coming into contact with humans. However, should a human linger close to a blacktip food source, these sharks will put whatever timidness they have aside and may choose to attack a human it views as a food source threat. Thanks to their strong bodies, the blacktip shark will provide a challenge to any fisherman trying to catch one. Due to their size, catching them on spinning tackle will take a considerable effort. With these qualities, blacktip sharks make for excellent fighting fish in Miami Beach and they provide a lofty challenge for experienced anglers.